Is Lean thinking the same as kaizen thinking? Kaizen thinking is a unique way of thinking that is learned when one participates in Toyota-style kaizen. This type of kaizen is rooted in industrial engineering (IE) methods and is practiced for the purpose of improving productivity, with a goal of reducing cost (where “cost” is understood to also mean quality, safety, lead-time, etc. ), and developing human thinking and capabilities to achieve these as part of one’s daily job. The overall objective is to create continuous flows of material and information by eliminating waste, unevenness, and unreasonableness because this is the lowest cost method of producing goods and services. Kaizen teaches that all work activities are processes and that all processes can be improved. Therefore, the basis for problem-solving is the work itself, which, of course, is directly related to the company’s costs and profits, its mission to serve customers, and well as customers’ many and varied interests. These things are connected to one another. I find that people mistakenly think these are easy to grasp because their conception of kaizen is finite, rather than infinite. When confronted with abnormal conditions, I do not refer back to Lean thinking. Why? Maybe it is because I learned kaizen first. Or, more likely, it is because kaizen is a much better process for recognizing problems and making improvements than the method specified by Womack and Jones. 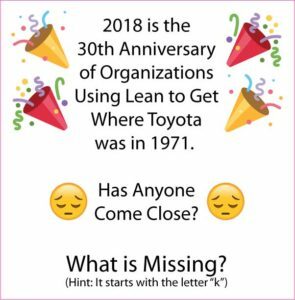 I do recognize that people who have not learned Toyota-style kaizen may benefit from Womack and Jones’ Lean thinking construct and make meaningful process improvements. But, the fact is, kaizen is far more powerful. Therefore, it is my hope that people who learned Lean thinking first will eagerly seek out Toyota-style kaizen experiences. Let me explain why kaizen is far more powerful. Toyota-style kaizen is remarkable for how it develops human thinking and capabilities for improvement. With kaizen, you learn how to balance stakeholder’s interests, eliminate say-do inconsistencies, challenge your beliefs and assumptions, reduce illogical thinking, and eliminate common decision-making traps. Recognize that the origin of corporate distress is bad thinking, and Toyota-style kaizen helps leaders avoid bad thinking. Costly errors are therefore fewer in number and smaller magnitude when they do occur. Lean thinking does not teach these important things nearly as well as kaizen thinking. While Lean thinking can be a significant improvement over conventional thinking, it is far less effective than kaizen thinking at developing people’s capability for good thinking. Good thinking leads to good decisions, whether one works on the shop floor or in the top offices. And, good decisions mean people are not harmed. It is also worth noting that Womack and Jones’ emphasis on Lean thinking as a means for learning and developing people, and also respecting people, is a recent development. It is a revision of the original technocratic construct presented in the book Lean Thinking. Click here to learn more. For some time now, it has been common to hear people say that Lean is a strategy for creating competitive advantage, innovation, and sustainable growth. Can Lean really do all that? It surely cannot do that without Toyota-style kaizen. Each of these commonly desired characteristics – competitive advantage, innovation, and sustainable growth – suffer large debits in the absence of kaizen. In other words, Lean, without Toyota-style kaizen, offers far more than it can possibly deliver. So, the answer to the question, “Is Lean thinking the same as kaizen thinking?” is “No.” Lean thinking and kaizen thinking are different, and imbue people with significantly different thinking and capabilities for improvement. If you have not learned Toyota-style kaizen, you should. Focus on that. Excellent, thank you, this article clarifies a number of points for me. I have long held that “…the origin of corporate distress is bad thinking”. Improve the thinking and the whole tone of the organization improves. I wish more CEOs would recognize this point. Totally agree. I obtained 1st Kaizen training working for Nissan Australia, next was Lean, but it was 8 years working for KAIZEN Institute where I understood a “true” Kaizen approach – it’s all about the PEOPLE. I see Lean Thinking as the Production System using PDCA where Kaizen is the cycle under A (Act). So basically, you establish your processes with Lean Thinking (sort of BPM approach in Lean) and Kaizen (sort of process improvement) to continuously improve the current state. Kaizen contains within it its own never-ending PDCA loop. I have a different opinion. I consider Lean to be the culture or framework that motivates the kaizen process. Lean describes the bigger picture: creating a transparent vision and performance metrics, empowerment of the team, awareness of and intolerance to muda, muri and mura. Kaizen, to me, is the problem-solving and improvement process within this larger Lean context. It isn’t “better” than Lean, it’s a critical part of Lean. Like many other words in the TPS/Lean lexicon, I struggled long & hard to understand the real meaning of the word Kaizen. My breakthrough came from the realisation that real understanding of the meaning of a word was not to be achieved from the study of the characters & letters of the words themselves; but from studying the behaviour, attitudes & results they created. In Zen Buddhism the measure of a teacher is not their own knowledge of a subject, but the understanding they can give to the people they teach. From my studies & practical applications over the last 36 years I evolved the following explanation. I have found the best way to get people to understand Kaizen, is to explain why they need to do it, & the benefit they will personally get from doing it. At the start of our Kaizen workshops, we draw on a flip chart pad a man walking down a road followed closely by a road roller, I write on its speed as 3mph. I then ask the delegates, if we were that man & the road roller is our competitors, how fast we need to go to avoid being flattened. The answer is faster than 3, & we normally agree 6mph will be safe. I then point out that this is no good at all. To explain this I ask them to turn the clock back to 1962, the year I finished my apprenticeship & manufacturing was still a major part of the British economy. The man is a company called Norton, one of the world’s finest motorcycle manufacturers employing thousands of people, & the road roller is a Japanese company called Honda. If Norton were doing 6mph, Honda were doing 1mph & were 100miles behind Norton, & posed no threat to them. I then write on the chart the current year, & ask where is Norton & the rest of our motorcycle industry. All gone, & Honda is the largest manufacturer of motorcycles in the world. What happened? We were that good & they were that bad, but we lost and they won. What happened? After a suitable pause, I then make the point that success in the long term business race does not go to those moving the fastest, but those accelerating faster than everyone else in the race. It doesn’t matter if initially you are last, as the Japanese were in cars, cameras, electronics etc., as long as you improve/accelerate faster than everyone else you will win. The Japanese have a name for this acceleration/improvement process; it is Kaizen. It is their word for all the activities that continuously improve of everything we do & create. And be giving them ‘Delightful Experiences’ in all their direct & indirect contacts with the supplying organisation’s products, services and people. These measures (P.S.E and Q.C.D.D) must drive all the different elements of our Kaizen activities. Our future success is guaranteed if we can continuously improve these values faster than any existing or future competitor. Kaizen is about continuously achieving all of our goals. The practice of Kaizen also includes activities that will avoid losing the improvements gained. I have learnt two fundamental rules of Kaizen from my study & practice of TPS/Kaizen in Japan (20 visits) & with our European clients (1700 workshops). They did not receive sufficient attention when TPS was translated into Lean thinking. This could explain the difference between Japanese & some Western academic interpretations of Kaizen. 1) Can we remove it before we improve it? We should not be improving activities and things that should not exist. This is waste elimination – waste being all items and activities that do not contribute directly to producing the P, S and E that will delight the customer. What cannot be removes should then be the focus of our improvement activities. This is often lost in the complexity of VSM..
2) Maintain the gains, sustain the change. I speak from personal experience when I say this can be a challenge to the western mind, unfamiliar with the concept of Yin and Yang thinking. Once we have secured the improvement and ensured there will be no deterioration (YANG-Rigid thinking to standards); we can press on with the continuous improvement process (YIN – Flexible thinking). It took me many years to get comfortable with this Yang-Yin idea. This second rule is essential to rigidly maintaining the improved situations and flexibly continuing our improvement activities. To truly understand Kaizen, I think it helps to remember the words of Archimedes; “Give me a lever long enough and I can lift the world.” 0ur people’s combined abilities are the lever to raise our organisation’s performance to world class levels & keep it there. Kaizen is the focus/fulcrum for its application.